Who doesn’t like a good bowl of cereal? Some of my closest friends still eat the stuff for dinner because it’s easy and never a bad idea. You TOO can eat cereal for any meal now with the opening of The Cereal Bowl in Cleveland Park. Cereal Bowl served its first bowl last Tuesday but is celebrating their success thus far with primary menu items running for $1 from 6 to 10 p.m. tonight. Their menu includes cold bowls like “The Sweetest Thing” featuring the sugary stuff you had as a good and “The Give Me S’More” which is like your favorite campfire memories shoved into a bowl. There are also healthier items like the “Let it Fly” featuring Life and Wheaties cereal, dried mixed berries, and granola. Join the latest addition to Cleveland Park this Saturday for its official grand opening from 10 a.m. to 1 p.m. The Cereal Bowl is located at 3420 Connecticut Ave. N.W. and is just one of 3 other east coast locations (the others are in Newark, DE and New Brunswick, NJ). 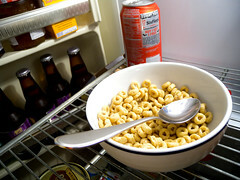 The Cereal Bowl is open from 6:30 a.m. to 10 p.m. on weekdays, with the exception of an 11 p.m. closing time on Fridays. Oh! I’ll have to visit the one in New Brunswick sometime.